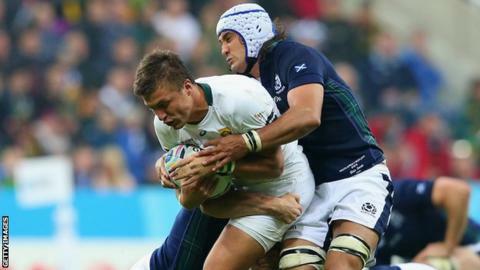 Scotland must make a fast start to Saturday's World Cup match against Samoa, according to flanker Blair Cowan. Vern Cotter's men have been sluggish in the early exchanges of Pool B games against Japan, the United States and South Africa, before rallying. "In the opening 20 minutes they will come out firing and we have got to be on a par with them," said Cowan, 29. "They are fierce warriors. We are very aware of their strengths." Samoa beat USA 25-16 in their opening match but lost by 40 points against the Springboks and on Saturday were defeated 26-5 by Japan. New Zealand-born Cowan, whose father is from the Cook Islands and whose mother is Scottish, regards Samoa as "dangerous" opponents. "I played with a couple of them when I was younger and I know how talented and physical they are," he said. "They will want to finish on a high. One thing Samoans bring is passion. "It will probably be the biggest game of my career to date. If we win we are through to the quarter-finals of the World Cup. "We've got the goods, we've just got to be smart. We will focus hard this week." Meanwhile, former Scotland skipper David Sole hopes Mark Bennett, John Hardie and Finn Russell can prove their fitness in time for the match. Speaking to BBC Radio Scotland, he added: "Samoa have definitely been disappointing this World Cup. "Everybody expected them to be much more physical, much more abrasive and to have defeated Japan comfortably and to have been much more competitive against the Springboks. "They've got nothing to lose by going out and trying to prove a point, which makes it quite a difficult assignment for Scotland. "Scotland will be going into that game as favourites whereas before a ball was kicked Samoa were the seeded side to go through in the world rankings. "If everybody is fit Scotland should progress and find themselves against Wales or Australia in the quarter-final."